Don’t you love the fun of playing with stitches? I think my favourite thing about canvaswork embroidery is that it is so easy to play – a piece of canvas, some colourful threads, a handful of stitches and some simple geometry. Numerous designs just unfold beneath your fingers! For the last week I have been working on a new design to teach at the Embroiderer’s Guild of WA later this year. 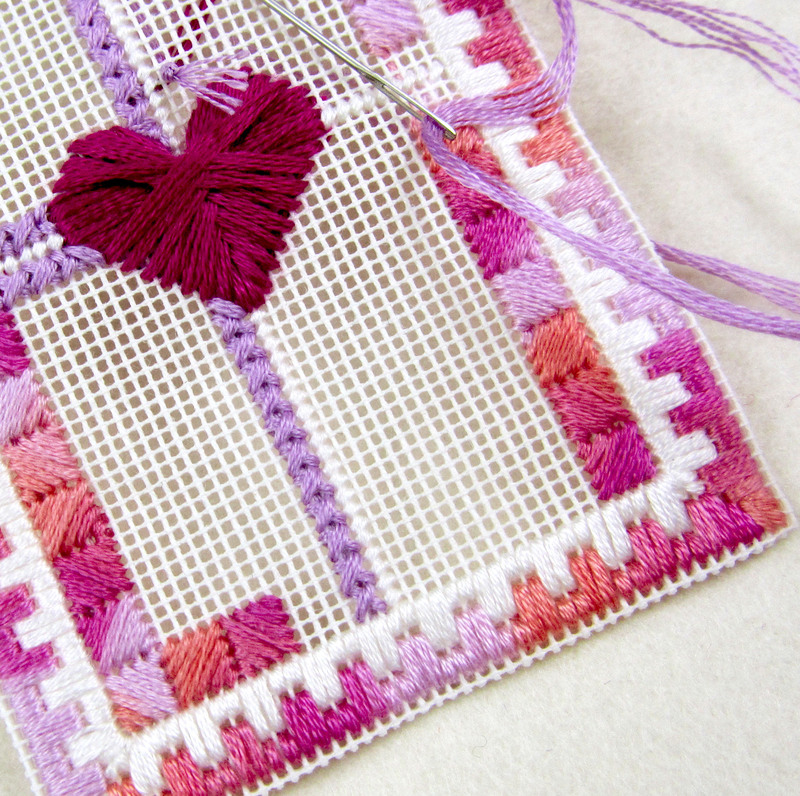 I wanted a small, colourful piece of embroidery that could easily be made up when completed. I came up with this simple wallet to hold my business cards. My new business card wallet. 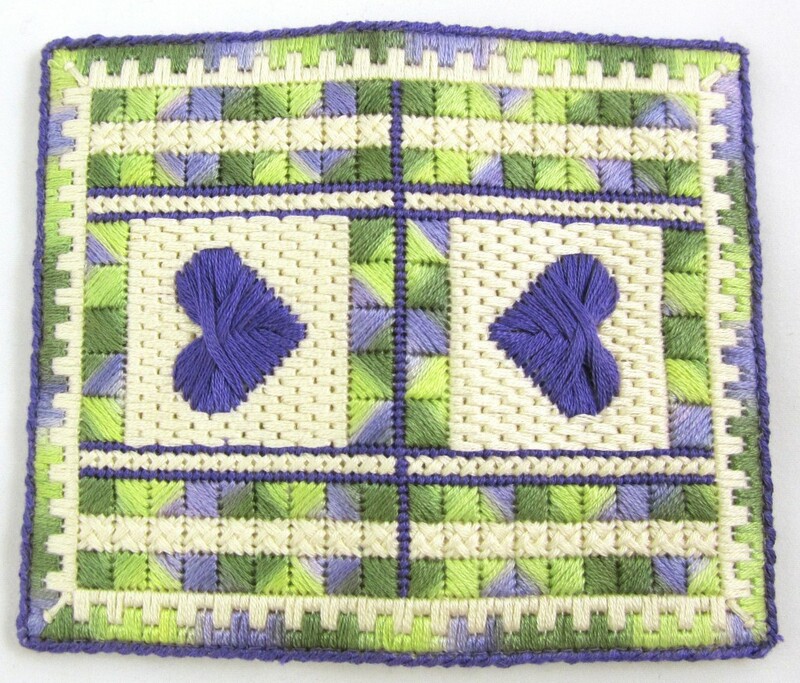 The design is based on one of my favourite Threadworx colours – Hawaiian Flowers (No. 01068). I often work this way – choose a variegated thread and match it with a few solid colours for a perfect colour scheme. Here I have simply added the darker purple for contrast and cream for a background note. 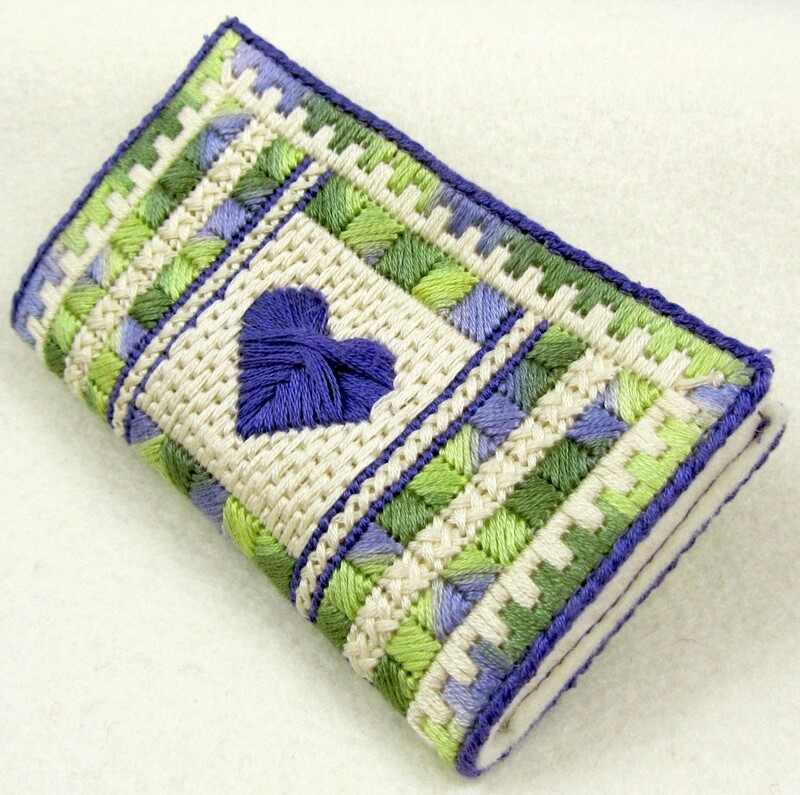 The wallet laid flat to show the fully stitched design. Making up couldn’t be easier. 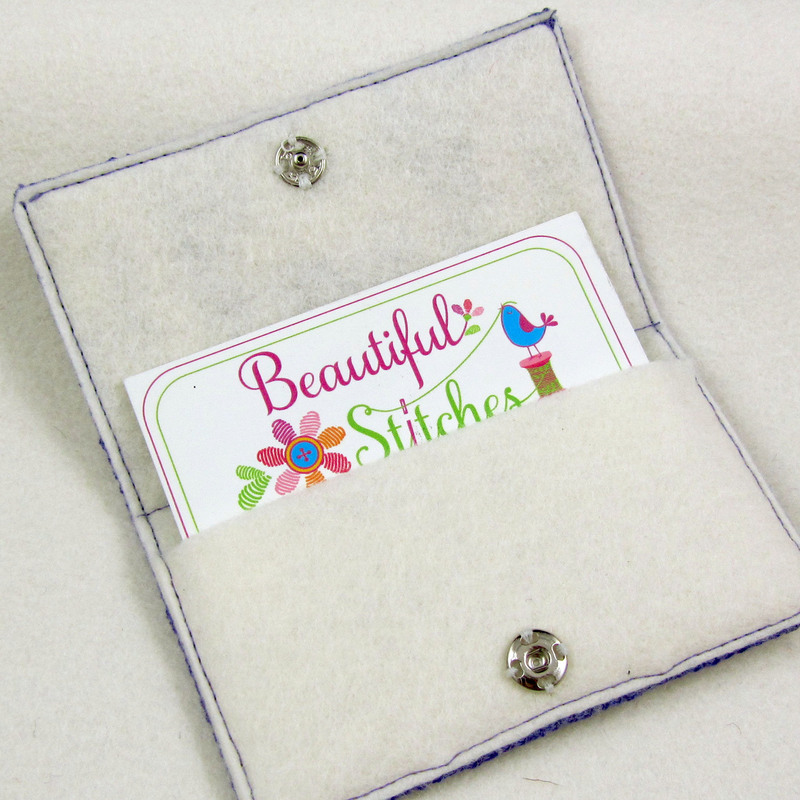 A piece of cream pure wool felt lines the embroidery and creates a pocket all in one step. And then I simply added a snap fastener. The really fun part of playing is all the spin-offs that come from developing one design. Here I have started work on a variation in a different colourway and size. A couple of weeks ago I wrote about cleaning out my sewing room and then about the Year of Finishing I undertook some years ago. These two circumstances conspired to bring about another piece of finishing I thought I would share with you today. Whilst cleaning and sorting out after Christmas I came across this little piece of cross-stitch that I worked (I am ashamed to say :)) over fifteen years ago. Four patchwork designs worked in cross-stitch. It is a dear little piece of simple patchwork designs worked up into a series of pretty cross-stitch squares. Sadly, I no longer have the pattern so I can’t tell you the designer or where I bought it from. Suffice to say that I remember thoroughly enjoying working it, but that it was then carefully filed in my box of “finished embroidery waiting to be turned into something”. Detailed view of one of the designs. I happened to mention this piece to my Mum on the phone the other day and she remembered it. 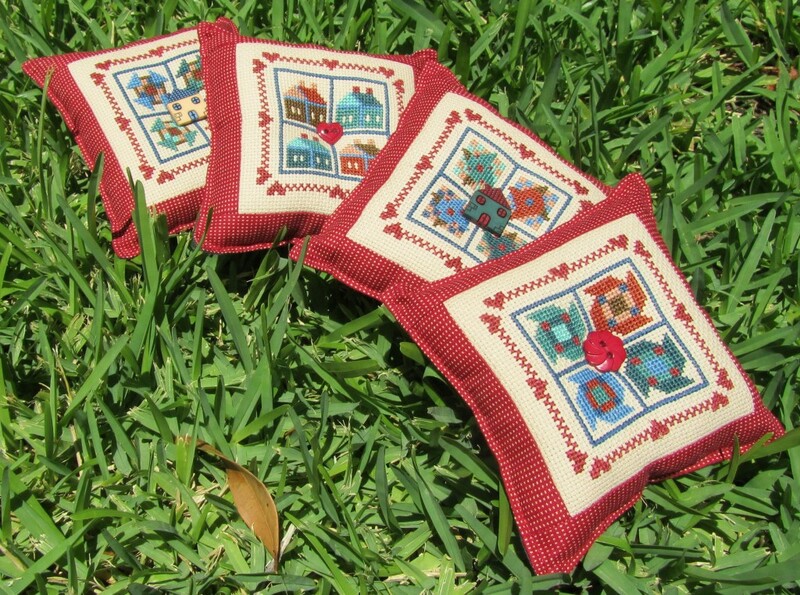 “Why don’t you turn them into a series of pincushions and donate them to the Embroiderer’s Guild gift shop?”, she said. This struck me as such a good idea that I have gone ahead and finished them all today. They are very “country” which is not my usual style, but I am really happy with them – especially the cute little buttons to finish them off. I plan to donate one to my Patchwork Group for a forthcoming fundraising event; two to the Embroiderer’s Guild Gift Shop; and I will keep one for myself, just to remind myself about another piece of finishing. My halo will choke me! Do you consider yourself to be creative? I used not to, but over the last few years I have become much more comfortable with believing myself to be creative. And I am really interested in the ever increasing research into what makes us creative. Then in 2007 I enrolled in the Canvaswork Masterclass at the Victorian Embroiderer’s Guild. Every month we would meet for a few hours at Guild House and learn something new about canvaswork, as well as being given a design brief for the sample we needed to work on over the next four weeks. Every sample piece had to be our design – an original piece of work. Initially this was an incredibly daunting prospect. For someone who had worked off patterns for over thirty years, I was suddenly faced with producing a whole body of work which was all to be “created” by me. To make it worse, I felt like I was surrounded by people who already had a flair for embroidery design. They seemed to produce wonderful pieces effortlessly – my work felt clunky and awkward by comparison. And then in one session, we learned to use Tyvek. If you haven’t heard of it, Tyvek is a synthetic, non-woven material that is very strong – almost impossible to tear but easy to cut with scissors or a knife. It has a wide range of industrial uses, but from an artistic point of view it has one fascinating property – when you apply heat it melts in predictable but irregular ways, creating fabulously interesting shapes. A small amount of heat, from an iron for example, causes the material to shrink and “bobble” – more heat and it starts to melt through the material completely. Tyvek can be coloured in just about any way you can think of – paints, coloured pencils, dyes, inkjet printers etc. So it is a creative material with almost limitless possibilities. Click here for a good introductory video. During our class we produced a range of Tyvek samples. Here are some of mine mounted in my portfolio. The orange sample at top left has been ironed until it starts to deform heavily, whereas the red, blue and white samples have only been lightly heated. 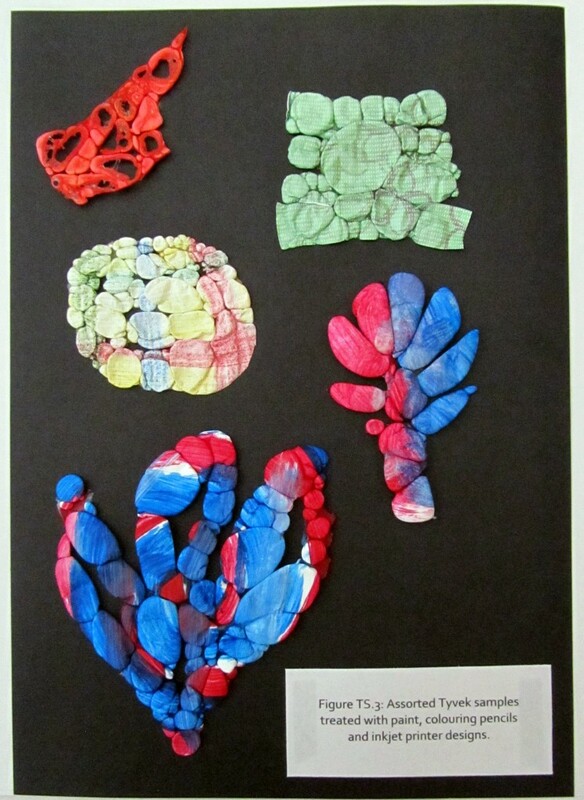 Assorted Tyvek samples treated with paint, colouring pencils and inkjet printer designs. Our challenge then was to include a piece of Tyvek in a “modern” interpretation of canvaswork. I created this journal cover, using Jill Carter’s book, “New Canvaswork”, as inspiration. 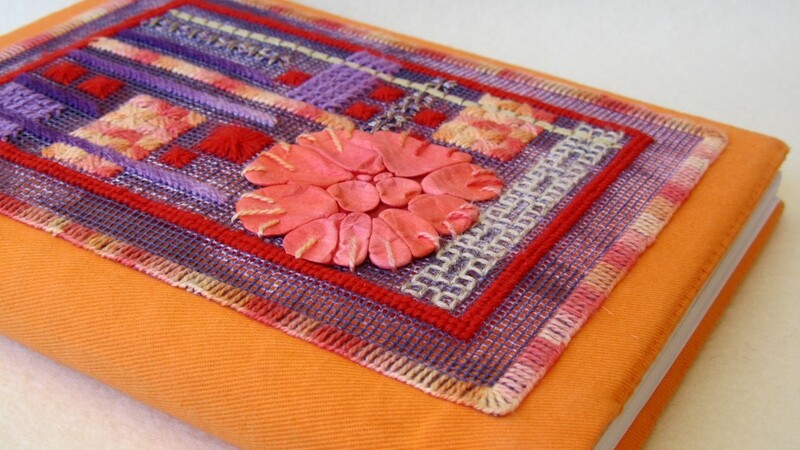 A5 journal cover worked in modern canvaswork with Tyvek embellishment. I think this was the first piece where I really started to feel like I was creative. It wasn’t easy, and at the time I remember ranting about how I “didn’t do modern” – I was a “traditionalist”. But this piece worked its way into my heart and became one of my favourites. And from then on I was hooked on creativity – the fun of coming up with an idea; the hours of work that going into realising the idea; and the satisfaction of finishing and knowing “I created that”. Creativity like that is addictive – and it gets easier with practice. Somehow your mind and body become more and more comfortable with the creative process and so you don’t fear it anymore. And coming from a scientist who spent decades believing she wasn’t creative, that is a pretty cool thing! 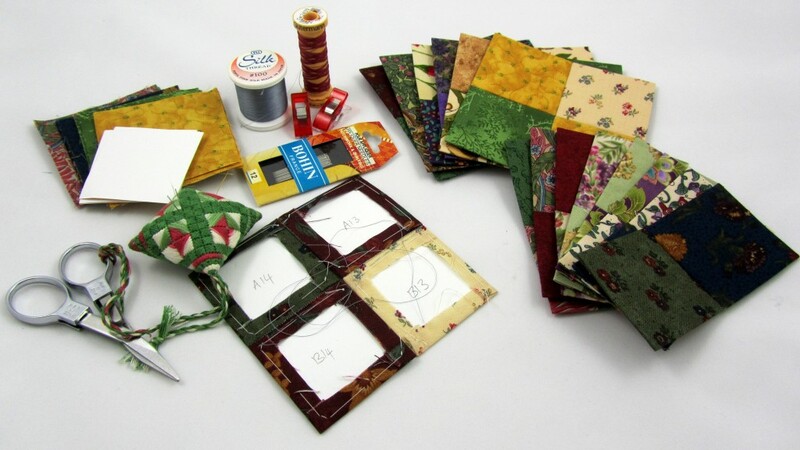 Over on Mary Corbet’s Needle’n’Thread blog, Mary has been talking about “Grab and Go” projects this week – the projects you can pick up and take with you so that you always have some sewing to hand when a few spare minutes come your way. My favourite “Grab and Go” at the moment is a paper piecing project I have been working on for quite a while. It was inspired by a friend from my patchwork group, who makes beautiful quilts in strips using the English paper piecing method. After drooling over her work for several months I decided to dive in and give it a go. I loved the idea of having a long term project that I could pick up and work on whenever I wanted – and I am making it for me so there is no deadline. 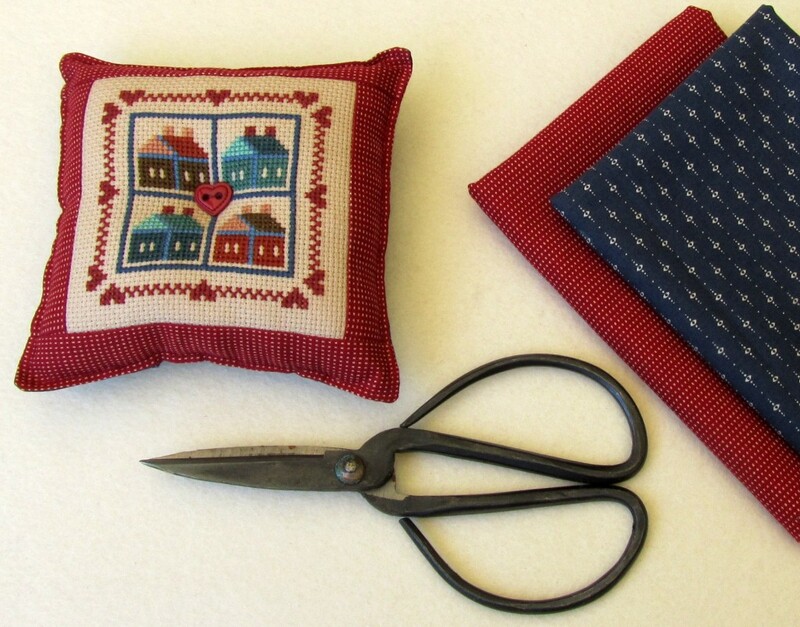 This is relaxing sewing at its best! I had done EPP before I started this project, but had never attempted something on a larger scale. The idea of this quilt is that you work each part of the quilt as a strip, join them all together, then finish with a series of borders. 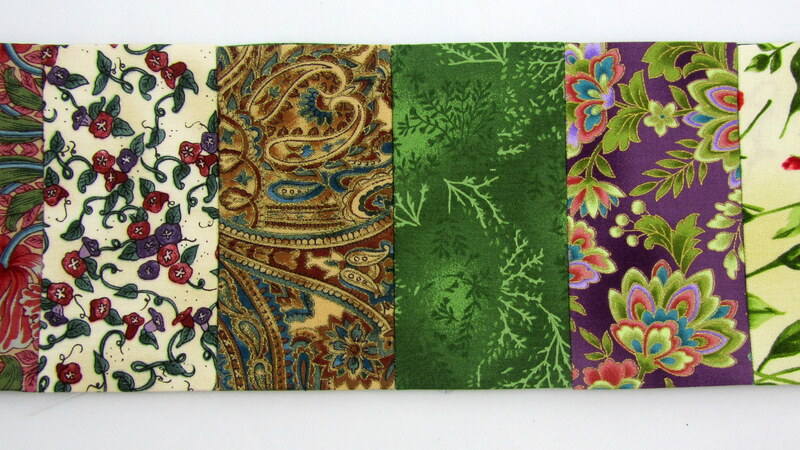 And there is no pattern – just choose a lovely collection of fabrics and start stitching. 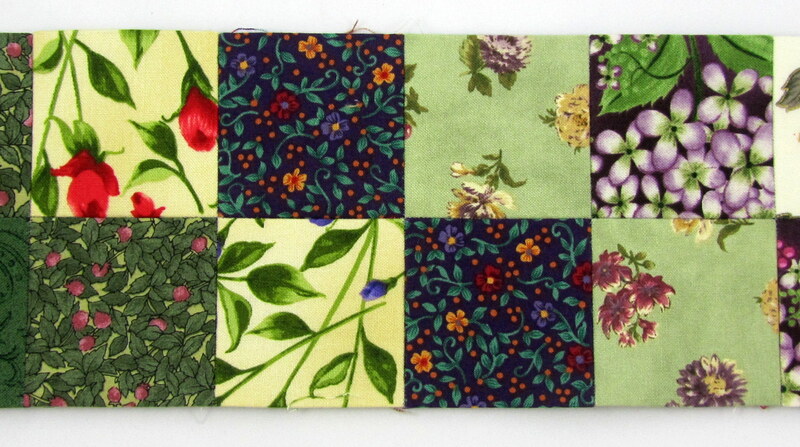 It just so happened (of course :)) that I had a lovely collection of fabrics in my stash that were perfect for this project – some old-fashioned florals, a few Japanese style florals, some small prints and a few solids thrown in for variety. I started with rectangles and squares as my first strips. Each rectangle is 2″x4″ and each square is 2″x2″. Each strip is 22 pieces wide – 22×2″=44″. Paper pieced rectangles, each 4″ x 2″. 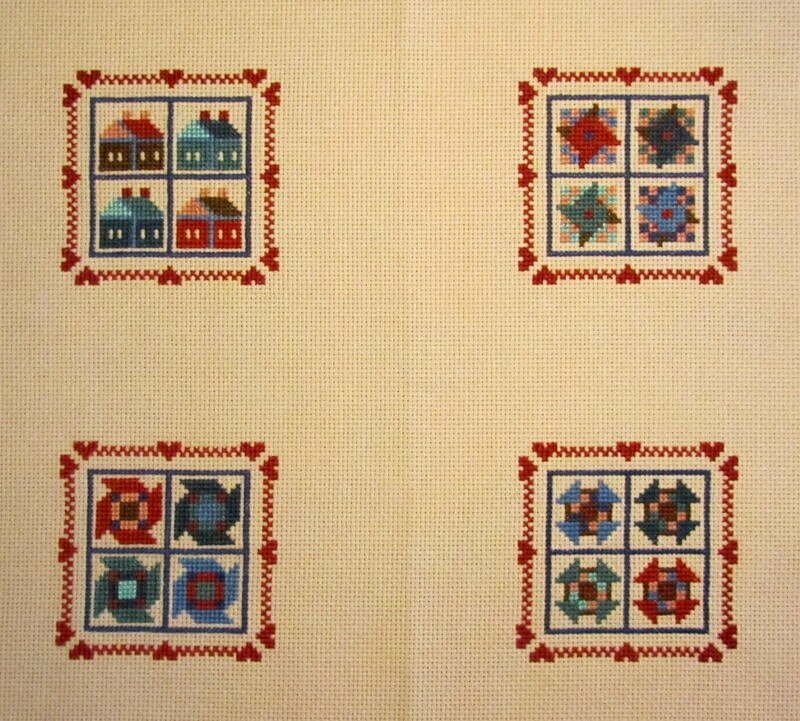 Paper pieced squares, each 2″ x 2″. Then I moved onto hexagons and pentagons. 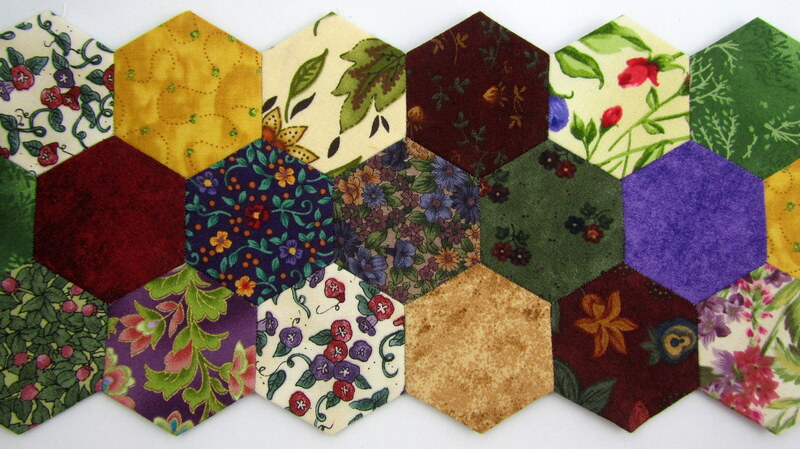 The pentagons will be appliquéd onto a cream background to create another strip. 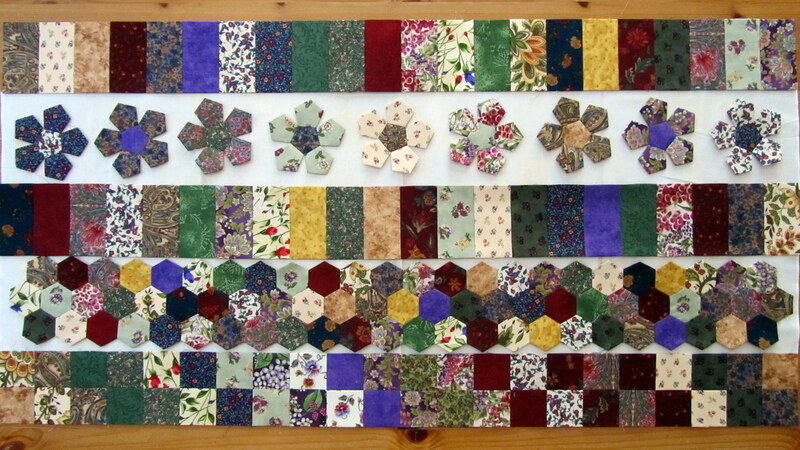 Paper pieced hexagons – I just love all these colours together. 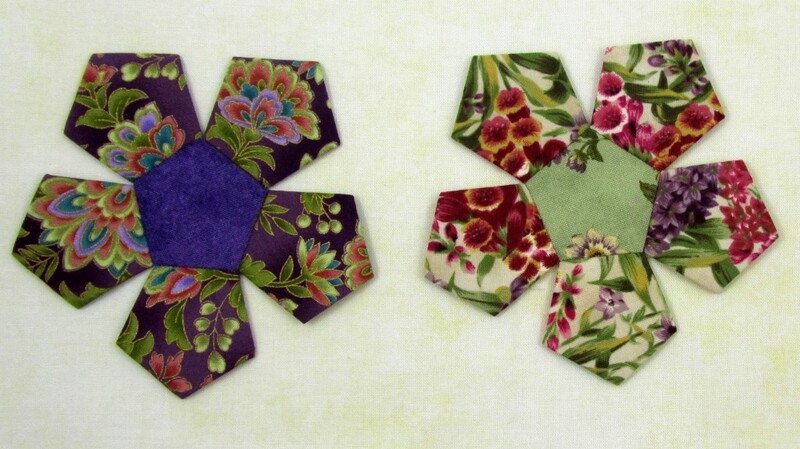 Pretty pentagon flowers – these will be appliqued onto the background fabric. I also plan to do some stitchery on the same cream ground fabric and intersperse these strips amongst the pieced strips. And after purchasing “Quilting On The Go!” by Jessica Alexandrakis recently (you can find Jessica’s fabulous blog here), I am inspired to add some diamonds and triangles in future strips. This project is perfect for “Grab and Go”. I keep a little zip-lock bag in my handbag with just enough supplies to work on one strip at a time. And a larger box at home keeps the whole project in one place. Everything I need to work on one paper pieced strip – and it all fits neatly in a zip lock bag. This project is growing organically – which I love. I don’t quite know how it will look when I am finished, but I will love it anyway because it has brought me so much pleasure in the making of it! Some years ago we were living in Melbourne and I was a member of the Embroiderer’s Guild of Victoria. The monthly magazine, Threadlines, had an article entitled “A Year of Finishing”. The idea was that if you were feeling overwhelmed by the number of UFOs in your cupboard that you make a commitment to a full year of finishing projects. And you weren’t allowed to start any new projects! At the time my children were still very young and I often felt like I couldn’t sew as much as I liked – and I had a cupboardful of unfinished projects! So the article really struck a chord with me and I decided to do it. In fact, I had never been a good finisher. One year in high school (early eighties) I made cross-stitch bookmarks as a Christmas gift for all my teachers. My Art teacher immediately pointed out that my crosses were not all going the same way and somehow in my head this translated into a fear of not finishing things “properly”. So I had a cupboardful of cross-stitch projects with large swathes of crosses all completed (with all the crosses in the same direction) but no half-crosses, no back-stitch outlines, and no isolated single crosses – in case I somehow didn’t do it “right”. 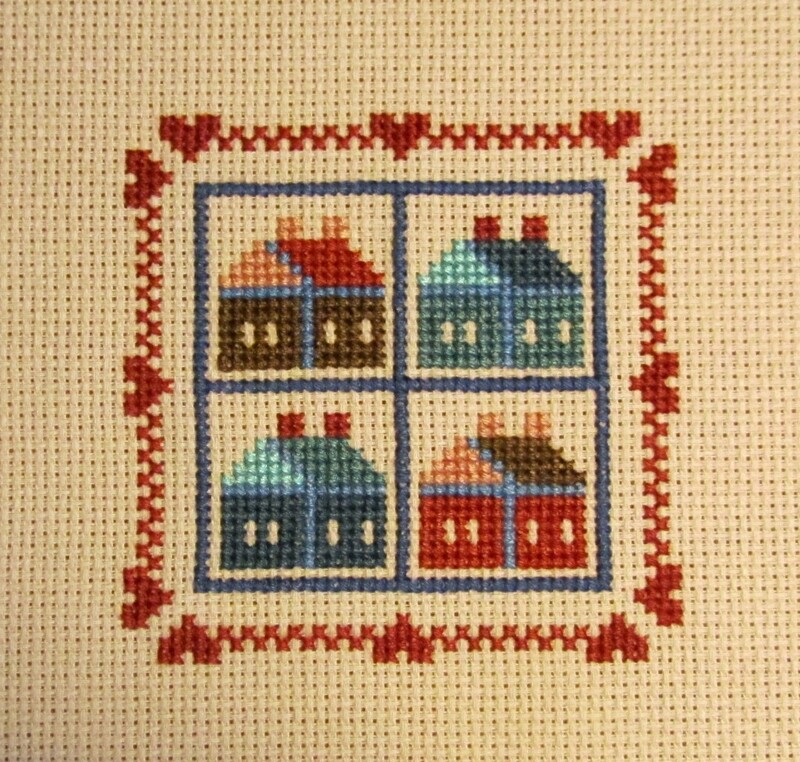 A completed cross-stitch from the “Country Companions” series by DMC. 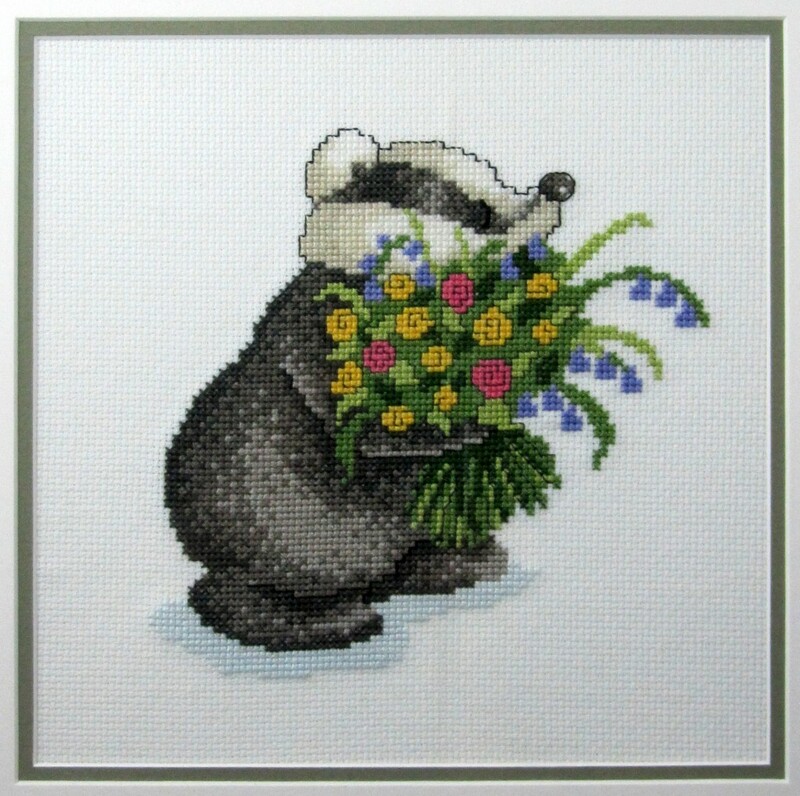 Another completed cross-stitch from the “Country Companions” series by DMC. 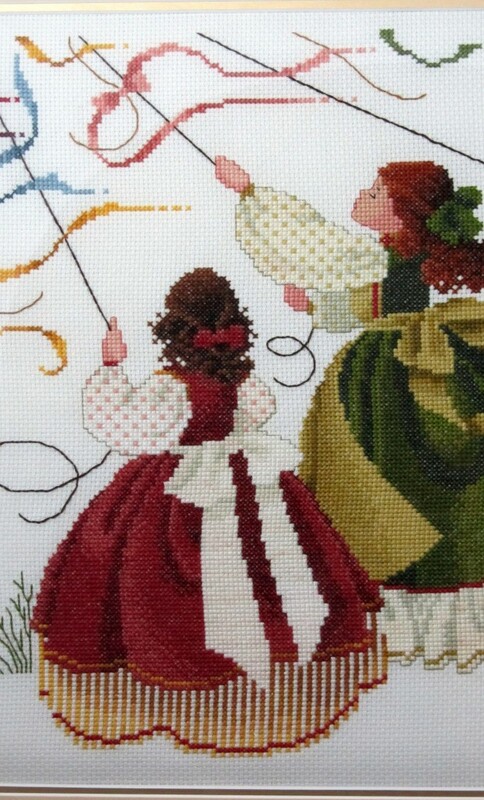 Detail of stitching in “Catch the Wind” by Butternut Road – one of my all-time favourite designs. My year of finishing was a revelation. It turned out that I could (of course) do all the fiddly finishing bits. The sense of satisfaction in finishing a piece and seeing it framed was wonderful. 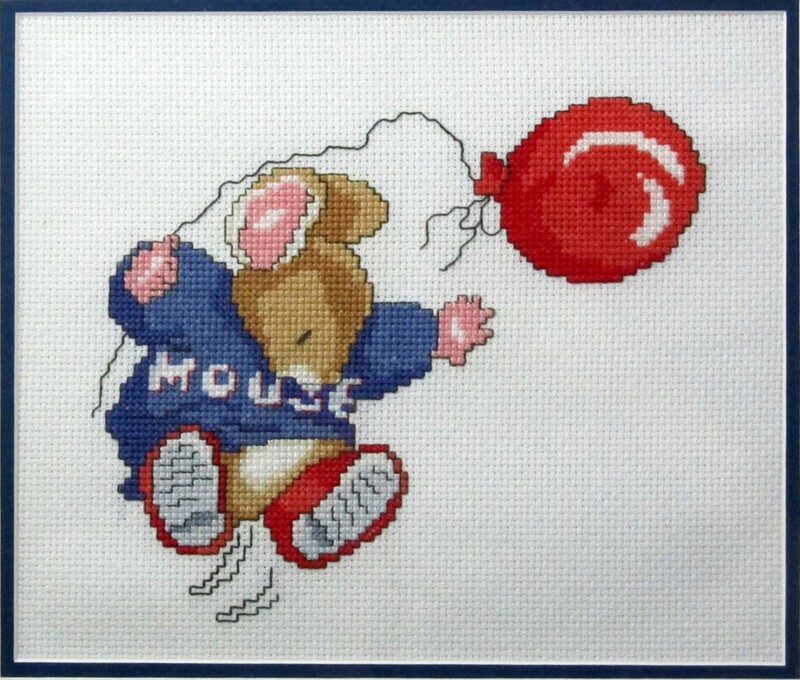 But having finished all those cross-stitch projects I realised that I wanted to do a lot more than just cross-stitch! My sewing journey irrevocably changed from that year onwards. Most importantly I found confidence in my own ability. Finishing something meant that I could really say to myself “I can do that”. So now my embroidery life has blossomed into something rich and wonderful, and so fulfilling. All because I spent a year finishing projects instead of starting them…..
What helps motivate you to finish projects? Or have you done something that changed your sewing journey too? I would love to hear your stories.